Built in England, the Wellington Harbour Board’s new Jubilee Dock was 178 m long, 36 m wide and could lift ships displacing 17,000 tons. It cost about £250,000 (equivalent to $27 million today). Two Dutch tugs undertook the record 22,000-km tow via the Suez Canal, which began on 15 July. The dock’s 11-man crew lived on board. Excitement grew as the dock neared. Wellingtonians could accompany it from the Heads by ferry for 1s 6d ($8) or view it from the air for the ‘small charge’ of £1 ($107). Thousands more watched from the shore. The dock entered the harbour on the afternoon of the 28th and anchored that evening. Next morning it was moved to a purpose-built dock. Later that day it slipped its temporary moorings in a northerly gale but was secured by the Dutch tugs. Its first lift, of the Ruahine, was made on 2 April 1932. 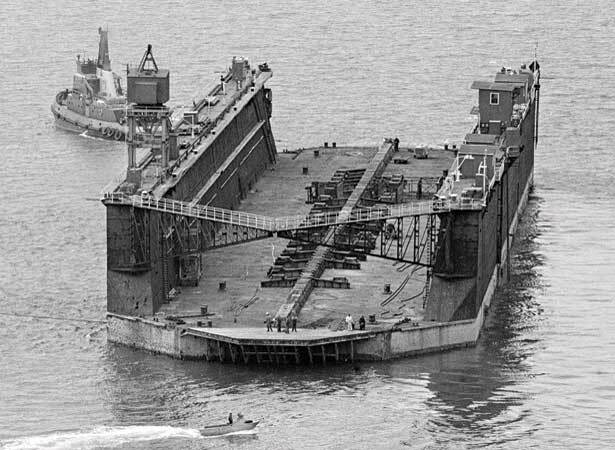 Too small to take container ships, the floating dock was eventually sold. In 1989, it broke in two in the Tasman Sea while being towed to Bangkok. We have 8 articles, related to Floating dock breaks moorings in Wellington Harbour .